For your small business or personal desktop, the FAXPHONE? L80 gives you the performance of a laser facsimile and a printer, with the added convenience of a telephone handset. With state-of-the-art fax capabilities and a six page-per-minute laser printer, this space saving business machine functions in the place of two devices. Now is the time to upgrade from a thermal or ink jet fax machine to the performance of quality laser output. 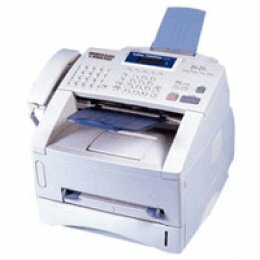 With features such as a 30-sheet Automatic Document Feeder, Super G3 facsimile technology and large fax memory, the FAXPHONE L80 surpasses single function fax machines hands down. Its compact size and telephone handset make this the perfect machine to have on any desktop to save space and provide the productivity of a fax and a printer. 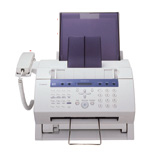 Printed faxes and documents will both have the same result - quality laser output. Features such as delayed sending, polling and reception restriction allow users to manage their fax operations efficiently. Directory search allows you to look up and dial the correct number by easily viewing the stored phone numbers in the speed dials, coded dials or registered groups. For desktop laser facsimile performance - the FAXPHONE L80 is the smart choice.